Downtown Westport rocked tonight like it hasn’t in years. It wasn't easy getting in the Spotted Horse door last night. An opening-night party for the Spotted Horse — the new restaurant in the 210-year-old Sherwood House on Church Lane — drew a wall-to-wall, out-the-door crowd. If they come back when the Champagne and food isn’t free — which they undoubtedly will — that crowd will transform downtown. 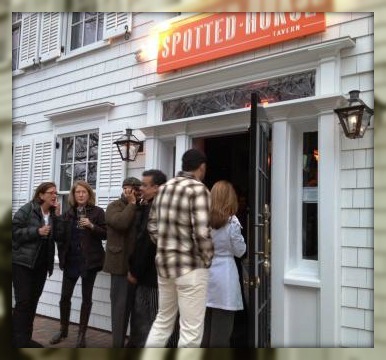 The Spotted Horse fills a gaping hole there: a restaurant with a great but casual menu; an enormous and inviting bar; a killer sound system; warm decor — plus outdoor seating. Until I walked in — and was embraced by the welcoming ambience — I didn’t realize exactly what’s been missing downtown for years. Spotted Horse owner Tommy Febbraio, and the opening-night crowd. Owners Kevin McHugh and Tommy Febbraio are Staples grads. They’re experienced restaurateurs — but this is their 1st Westport venture. They know they have to do it right. And they will. The Spotted Horse will draw folks downtown again, breathing life into a district that was gasping for it. Other downtown restaurants — Bobby Q’s, Tavern on Main, etc. — need not worry. As they say at the nearby Saugatuck River: A rising tide lifts all boats. This entry was posted in Downtown, People, Restaurants and tagged Bobby Q's, Kevin McHugh, Spotted Horse restaurant, Tavern on Main, Tommy Febbraio. Bookmark the permalink. “A rising tide lifts all boats.” Love that. Thanks for posting. Eat there last night, food was very good, service even thought it was packed was excellent given he crowd, and the restoration was done very well. Congrats to all who were involved in the process to bring the type of downtown eatery on top of all the other good options that are already there. 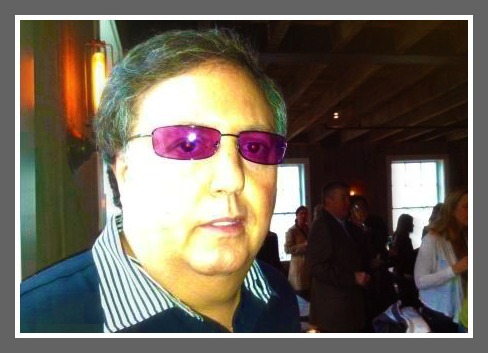 I happen to love the Grey Goose: great ambiance, food and drinx are awesome, staff is cheery and upbeat. I will banging on the door at this place — esp. since I’ve tried to love Tavern on Main for several years, for the ambiance alone – but the food is inconsistent, the service is minimally enthusiastic, and the management is downright nasty. Tavern On Main “used to be a favorite” of the Mrs. and myself. That was for many years, until the most recent owners took posession. Now, most evenings, you are merely a number to them. In and out is how they want you. Get your check and please head for the door! We are ready to seat another group, Thank you! And, the manager up front (forgot her name) has no issue with coming over to your table and actually asking you to depart, as if you are loitering! We miss the former owners/management. It was always a warm place to have a romantic meal. Now, you can see they are looking at the clock when you are first seated. Too many restaurants in this town where they do appreciate their patrons! OMG…that is EXACTLY what happened to us ! She (I think her name is Helen)… came over and said “you need to leave” … without any prelude or apologies. Life is too short to pay for abuse ! Congratulations on your new venture!! Looking forward to stopping in the next time we are in Westport!! Hey, Our 45th reunion will be happening before you know it!! Start planning for it now!! WE will pack the place!!! Hey T. February, how bout hosting an Assumption School reunion!! Now that would be nuts!! All the best, I hope the Spotted Horse is all that you want it to be!! All members of SHS ’70 (particularly those of us who have gotten a little “chubby” in their golden years if you know what I mean) should accept the Pepsi challenge to lose weight before the reunion and the winner (as a percentage of before/after BMI) gets to attend the reunion dinner at Tommy Febbraios’s establishment courtesy of the rest of the class.